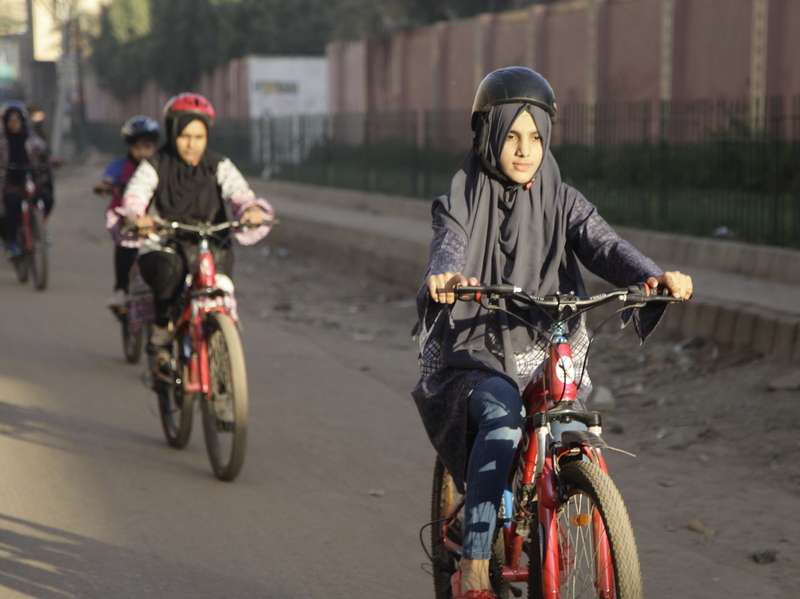 Women Who Bicycle In Pakistan Face A Lot Of Pushback : Goats and Soda If boys can ride bikes, "why shouldn't we?" asked Zulekha Dawood. So she organized a group that goes on weekly excursions — despite the disapproval of many men. Zulekha Dawood leads the group of female cyclists through the impoverished Lyari neighborhood in Karachi, Pakistan. They ride early in the morning to avoid the worst of the traffic. On a Sunday in early December, about two dozen women and girls weaved their bikes down the streets and alleys of the gritty Lyari neighborhood in the Pakistani city of Karachi. They nudged their bikes between rickshaws, motorbikes and crowds of men — men everywhere. Some turned their faces away to avoid the sight of women rattling past on bikes. Others gaped. A nearby samosa seller, Saqlain Usman, 18, shook his head. His three sisters wouldn't dream of undertaking such an offensive act. They stayed home, he said, where they belonged. "They fear their daughters will copy the riders," said Zulekha Dawood, 26, the woman's biking group organizer, who works to organize activities for Lyari's Girls Cafe, a community center. "Their fears are real. When we began, we had very few girls — maybe seven or eight. Now we have an entire group — 30 girls." Women and girls stretch on a pedestrian walkway in Lyari. 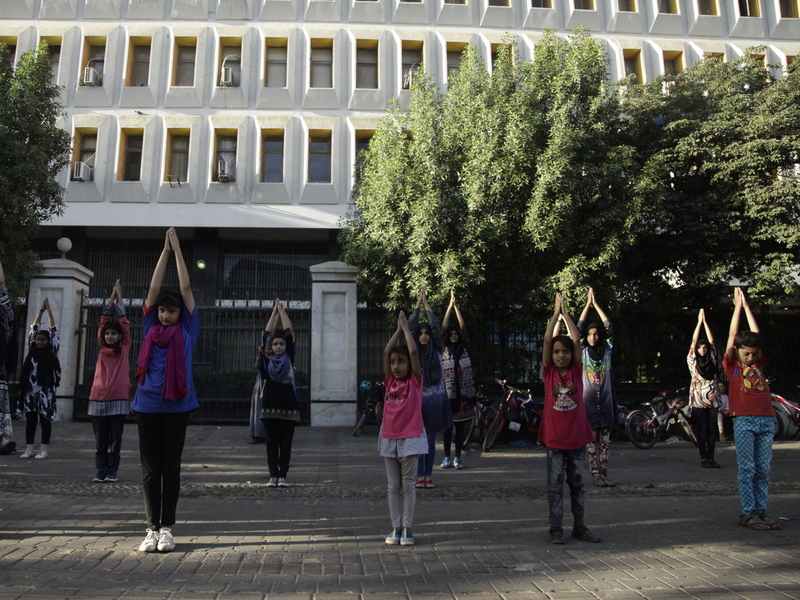 The sight of women exercising in public is often startling in Pakistan. Dawood started this weekly ride in February 2018. She had previously run a girls boxing club and saw some boys on bikes nearby. "If they can ride," Dawood thought, "why shouldn't we?" It is a rare endeavor in conservative Pakistan, where few women dare to cycle. It is seen as a vulgar and sexlike act because a woman must straddle a seat. The initiative echoes other pop-up efforts across South Asia and the Middle East. Some are inspired by a book by Indian feminists called Why Loiter? Women and Risk on Mumbai Streets. It discusses how in these parts of the world, a woman in a public space without a purpose — like going to the market or to school — is viewed as a threat to public morality, said Nida Kirmani, an associate professor at the Lahore University of Management Sciences, who has written about Lyari's Girls Cafe. "They certainly can't be hanging out just for fun," Kirmani said. Unlike men, women aren't welcome to sit at tea stalls, hang out with their girlfriends at a park or ride a bike for fun. The book Why Loiter? "advocates for women being in public spaces with no purpose," she said, "as a kind of feminist-political act." From the start, the Pakistani bicyclists have faced pushback. On their first ride, Dawood says, the girls were accosted by male madrassa students. "They were kicking the girls," she recalled, and she heard them shout, "Why don't your brothers stop you? Cover yourself and go pray! Go home!" One cleric, who runs a large Islamic seminary that was not involved in the violence, said that women riding bikes is a provocative act. "Is it necessary that they exhibit themselves among the men?" asked Mullah Muhammad Naeem. He said that such public riding leads "to moral corruption" and suggested that women ride behind high walls, unseen by men. In fact, Dawood created a route away from the madrassa, fearing for the safety of the girls riding with her. 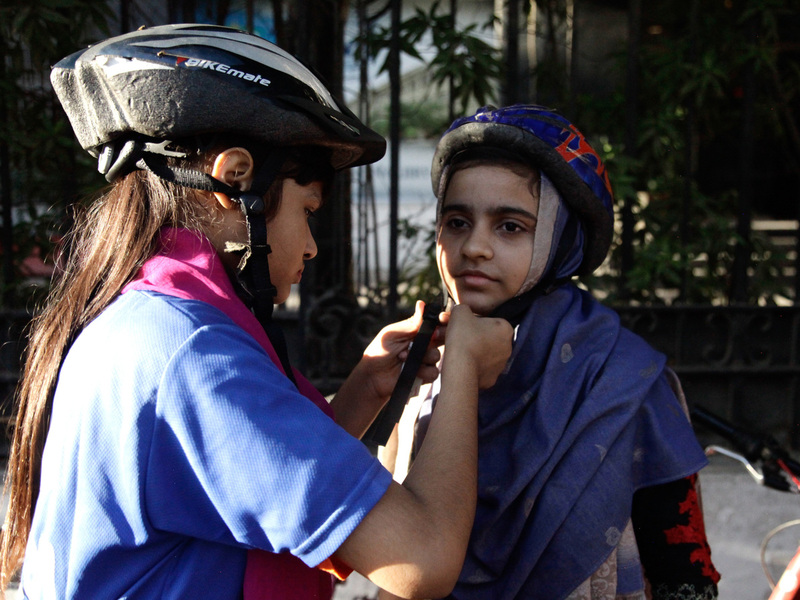 Her group of bikers is more remarkable because it is run by working-class women from Lyari. Similar efforts across Pakistan have been dominated by wealthier women in leafy, more liberal suburbs. They face tighter constraints than wealthier women. "When we first started cycling, people said, 'This is Lyari, not Defence,' " Dawood says, referring to an upscale Karachi neighborhood. Regardless of where a woman lives, she has a right to move freely, Dawood says. "This is empowerment. We feel good. We feel free. We can go anywhere." During that Sunday ride in December, Dawood guided some two dozen women and girls, most of them wearing headscarves, on red bikes out of the cafe's storeroom. They rode single file past boys playing in a narrow alley. Families sleeping on the pavement waved at the group, whose members rode lightly to avoid splashing through a pool of sewage. They reached a pedestrian area where other women were waiting for a riding lesson. Ayesha Abbas, 14, wobbled through a line of orange cones that Dawood set up for practice riding. "I'm afraid I'll fall," Ayesha said. Her helmet was unsteadily perched; like other riders, she had removed her face veil to see clearly. She had already made progress, she boasted — "I can keep my feet on the pedals!" Her friend, Hasiba Abdul Sattar, 14, kept her steady. "I'm teaching her," she said. Hasiba learned to ride only the previous Sunday. "I'm not perfect," she admitted. Her instructions were sometimes perplexing: "Put your feet on the pedals — then try walk." Naila Naz, 19, a college student, surrendered her bike to another woman who wanted to practice. Riding was part of her battle for women's equality, Naz said, which included "the right to go anywhere." And it suited a working-class woman. "We are common persons — we don't own the car — so we are starting from the cycle." Members of the women's bike group don helmets before their ride. Like many of the female riders, Naz credited her father for inspiring her independence. "Don't ask permission," she recalled him saying. "You have every right to be what you want." He was a rickshaw driver who died at 45 after a sudden illness — the family couldn't afford treatment. Now Naz lives with her relatives in Karachi. They probably wouldn't approve of her bike-riding. "I don't care," Naz shrugs. "I am my own person." Others were less defiant. Urooj Bisma, 12, all elbows and knees, often led the group. But she said most riders would probably feel pressure to quit as they reached marriageable age; otherwise their parents would struggle to find them a match. Already, she said, "the social pressure — when I think of what people will say — that also haunts me." She hopes to resist pressure as long as possible — she loves riding and setting an example: "When girls see us and are inspired, it really gives me immense pleasure. I want other girls to shed their fears and ride a bike." In a previous version of this story we stated that Karachi was the capital of Pakistan. In fact, Islamabad is the capital.